In Myrtle Beach located across the street from the ocean on acclaimed Shore Drive. Shipwatch Pointe is the perfect place for your family vacation in the heart of South Carolina’s Grand Strand. 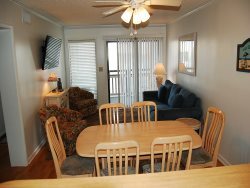 Come relax in this beautiful second floor condo that offers convenient access to the beach. Shipwatch Pointe Villas provide a central location convenient to the area’s famed “Restaurant Row”, Apache Pier, shopping outlets and many golf courses. Renovated Winter 2018 and includes modern beach decor, comfortable furnishings and three Flat Screen Smart TV’s with Blue Ray Player. This particular end unit overlooks the outdoor pool and has a great view of the ocean from the large balcony. Unit is a second floor walk-up and has two bedrooms and two bathrooms. Unit Sleeps up to 6 people on 1 queen-sized bed, two twin beds, and a queen sleeper sofa. (Sorry, no pets or motorcycles please.) Limit two parking spaces per unit.